For large problems, most of the memory resources are required for holding the matrix of the sums and crossproducts. The section Parameterization of PROC GLM Models describes how columns of the matrix are allocated for various types of effects. For each level that occurs in the data for a combination of classification variables in a given effect, a row and a column for are needed. The matrix has 425 rows and columns only if all combinations of levels occur for each effect in the model. For m rows and columns, bytes are needed for crossproducts. In this case, bytes, or about . The required memory grows as the square of the number of columns of ; most of the memory is for the A*B*C interaction. Without A*B*C, you have 185 columns and need 268K for . Without either A*B*C or A*B, you need 86K. If A is recoded to have 10 levels, then the full model has only 220 columns and requires 378K. The first two components of this formula are for the estimable model coefficients and their variance; the rest correspond to , , and in the computation of . If the operating system enables SAS to run parallel computational threads on multiple CPUs, then GLM will attempt to allocate another bytes in order to perform these calculations in parallel. If this much memory is not available, then the estimability calculations are performed in a single thread. Eliminate terms, especially high-level interactions. Reduce the number of levels for variables with many levels. Use the ABSORB statement for parts of the model that are large. Use the REPEATED statement for repeated measures variables. Use PROC ANOVA or PROC REG rather than PROC GLM, if your design allows. A related limitation is that for any model effect involving classification variables (interactions as well as main effects), the number of levels cannot exceed 32,767. This is because GLM internally indexes effect levels with signed short (16-bit) integers, for which the maximum value is . The time required for collecting sums and crossproducts is difficult to calculate because it is a complicated function of the model. 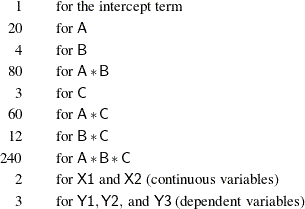 The worst case occurs if all columns are continuous variables, involving multiplications and additions. If the columns are levels of a classification, then only m sums might be needed, but a significant amount of time might be spent in look-up operations. Solving the normal equations requires time for approximately multiplications and additions, and the number of operations required to compute the Type III tests is also proportional to both E and . Suppose that you know that Type IV sums of squares are appropriate for the model you are analyzing (for example, if your design has no missing cells). You can specify the SS4 option in your MODEL statement, which saves CPU time by requesting the Type IV sums of squares instead of the more computationally burdensome Type III sums of squares. This proves especially useful if you have a factor in your model that has many levels and is involved in several interactions. If the operating system enables SAS to run parallel computational threads on multiple CPUs, then both the solution of the normal equations and the computation of Type III tests can take advantage of this to reduce the computational time for large models. In solving the normal equations, the fundamental row sweep operations (Goodnight; 1979) are performed in parallel. In computing the Type III tests, both the orthogonalization for the estimable functions and the sums of squares calculation have been parallelized (if there is sufficient memory). The reduction in computational time due to parallel processing depends on the size of the model, the number of processors, and the parallel architecture of the operating system. If the model is large enough that the overwhelming proportion of CPU time for the procedure is accounted for in solving the normal equations and/or computing the Type III tests, then you can expect a reduction in computational time approximately inversely proportional to the number of CPUs. However, as you increase the number of processors, the efficiency of this scaling can be reduced by several effects. One mitigating factor is a purely mathematical one known as "Amdahl’s law," which is related to the fact that only part of the processing time for the procedure can be parallelized. Even taking Amdahl’s law into account, the parallelization efficiency can be reduced by cache effects related to how fast the multiple processors can access memory. See Cohen (2002) for a discussion of these issues. For additional information about parallel processing in SAS, see the chapter on "Support for Parallel Processing" in SAS Language Reference: Concepts.